A standard tune-up, or spark plug replacement, done at the suggested maintenance interval will make an engine easier to start, improve fuel economy, lower emissions and restore lost power. Another (often overlooked) service designed to help your vehicle’s engine running properly is the cleaning of fuel injectors and the fuel intake system. When dirt and deposits collect on fuel injectors, the amount of fuel delivered to the engine is restricted, leading to deterioration in performance. 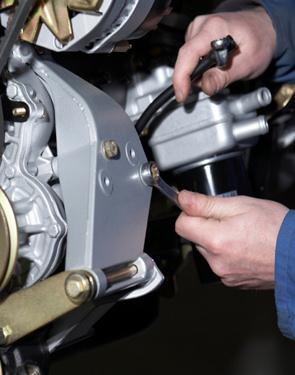 At Kwik Kar, our trained technicians can perform a Fuel Injection Service that will remove these deposits and help your vehicle maximize its performance and gas mileage capabilities. Regular maintenance of your vehicle’s fuel ignition system is the key to reliability, fuel efficiency, and effective engine performance. From fixing a fuel system problem when it occurs to helping you prevent one from happening in the future, the technicians at Kwik Kar are there to keep your engine “tuned-up” and ready to go.